It all started with a move to arrest the arrival of a paunch. Seemingly seamless. But pronounced. The seams of the trousers were bursting. Obviously all the sweets and fries had to show up someplace !! High calorie food stuck to all parts of the body. Like a Fixed Deposit that was left to grow. The paunch was packing quite a punch ! Then one day, a friend suggested that he was ‘running’ the marathon. Running ? There was enough to being an ‘also ran’ in life! Ten minutes on the treadmill was about what the feet could ever manage. Huffing, panting and almost sure that the 11 th minute would cause instant death ! This was June ’09. An internal war broke out. Resplendent slumber waging a relentless war on physical activity. ‘Running ? For gods sake, get real ! And four days a week’. Was a constant conversation in the mind. But when the favorite trouser didn’t fit, the missus had her hands on the hip and gave a look. A look that was a curious mix of pity, joy and sarcasm! The next day, I signed up for running. This was August ’09. The schedule was given. ‘Mondays. Wednesdays. Fridays. Sundays. Reporting time : 5.45 AM’ ! The eyes popped. The ears didnt quite register. ‘Reporting at 5.45 ?’ That meant getting off the bed by 4.30 AM ! With a trepidation reminiscent of my maths exam, i prepared to howl in protest. The only words that escaped the lips however sounded different. ‘Sundays too?’ So it all began. Running. 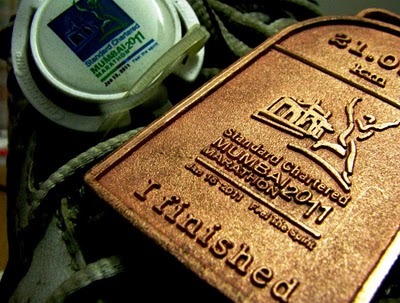 But the mind was clear : I wasn’t going to go anywhere close to the marathon. I was just going to run. Run the paunch down. That was that. But the group i was training with had other ideas. Of course, my coaches kept it to themselves. August ’09 : A couple of kilometers that the feet covered burnt a hole in the wallet buying pain reliver sprays and left the bedroom smelling of Bengay ! Perpetually. Gasping for breath was now not restricted to seeing stupidity at work. Parts of the body loudly announced their existence with stinging pain and stagnant aches. Knees. Muscles. Joints. Bones. All. September was better. The pain was around. Less pronounced on the body. More on the mind. I wonder if it would be any different with you..when somebody a good 20 years older zips past and completes the distance in half the time ! And we ran on the roads. We trained in Aarey. Dotted with thick greenery. Rustic smell of cow dung and grass punctuating the morning air and of course, awesome sunrises more than aptly compensated for the mosquitoes that were perhaps next only to the Scud missiles of Saddam Hussein ! October was even better. November fled by. Suddenly, It was early December. I was running 20 odd KMs. Slow. Steady. Huffing and puffing. But running. ‘Perhaps i can run the marathon’ became a refrain. As with most human minds, the monkey on the mind had moved on to the next branch. Finishing was not THE issue. ‘In what time’, became the big question. Jan fled. Taking with it all doubt of ‘completion’ of the race. It was 17th Jan. I was after all running the marathon. 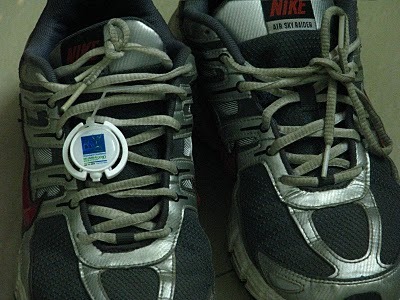 The timing chip was tied to the shoe. The bib was pinned to the t-shirt. Off i ran the Mumbai half-Marathon ! 2 hours 14 minutes was on the watch display as i finished. There were hordes of men, women and children cheering us on. Faces that i dont know. Voices that i hadn’t heard before. But words and gestures that i just cant forget. ‘Go Mumbai Go’ they screamed ! The slum dwellers who held out oranges. The sophisticated types who had household help offer biscuits, juices, water. The men and women who stood by clapping. I wonder what gets them to do these. Oh yes. Our blogger bunch cheered on too. With cheers, wishes, presence, prayers and offer for payasam ! The one gent who traveled from Pune to click a snap and cheer on. The others that set a mail thread that went like a river in flow ! What a swell bunch of people inherit this earth ! How blessed am i to know and connect up with them all ! So much for an ‘also ran’ ! Phew. I am done. With this race. But two things remain. Which must get mentioned. a. I am looking for one man with a blue T-shirt which had ‘are you tough enough’ written on his back. I will never forget this man. For at the 4th Kilometer he overtook me, looked into my eys and shouted ‘Dont GIVE UP’ ‘Dont Give up’. With bewilderment plastered on my face, i waved him on. ‘Give up?!! ?’ Whoever talked about giving up ? I had just started running. So, if you know that man, or you are that man…well, i need to talk to you. b. The paunch…you know… well…the paunch also ran ! The cause for all of this running, is by and large ( actually by and LARGE) at large ! Theres been no impact at all ! The missus thinks running 42 kilometers will perhaps wear it down. Ofcourse, like all times, i differ.